GBC Guardian is a proven, free1 service we are offering to help protect your accounts. GBC Guardian operates separately from our GBC Fraud Center. Cardholders can receive text alerts to their cell phone for enrolled KeyCard Debit Cards, ATM Cards, & Equiline Debit Cards. 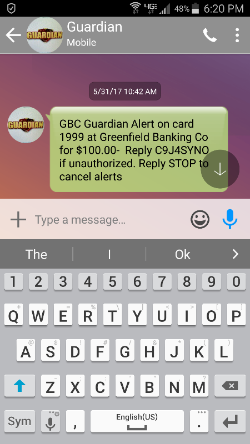 GBC Guardian sends a text message to you each time a transaction is conducted with your card number(s). If the transaction is not authorized by you, the message gives you specific instructions to follow to block all future transactions. Multiple devices (up to 10 per card) can be enrolled to receive the alerts. This service gives our cardholders the ability to identify potentially fraudulent transactions. A notification text is sent for every transaction on enrolled accounts. If it’s an unauthorized transaction, respond precisely as instructed in the text message. If you respond with anything different than instructed in the text message, the system will not recognize it an your reply will be ignored. The system allows the cardholder up to 12 hours to respond. “Do Not Disturb” time can also be set up, during which messages will be held for later reporting. Additionally, if you use our mobile app you can, at will, suspend activity on your card and reactivate at a later time within the "Preferences" option. For an added layer of security, please take a moment to enroll your debit card in GBC Guardian. Click the "Enroll Here" button below and follow the prompts. Taking these steps can assist in the prevention of fraudulent activity on your account. As always, please contact your favorite branch should you have questions concerning this and any of our other services.